Spanish animation and guest hosts! Alexander McDonald, director of the ANIMATION BREAKDOWN festival in Los Angeles, joins us in Portland along with an exiled, delusional Spaniard — Francesc Xavier de Manuel Ruiz, former curator of the Spanish animation fest, ANIMAC — to present an insane selection of... Spanish. Contemporary. Animated. Shorts. ¡Olé! A bilingual compendium of animated "tapas" packed with spine-chilling fables, heart-warming violence, and a pinch of synesthetic experimentalism. Want some samples? Rejoice before the cutesy bear cubs of Alberto Vazquez in their hunt for unicorn blood! 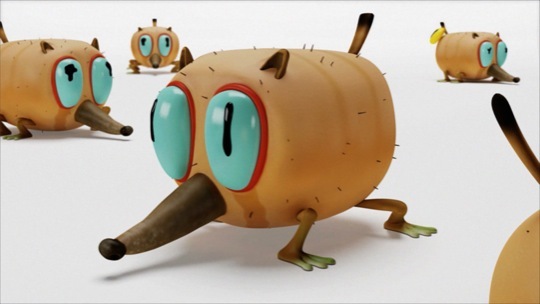 Discover the doomed CGI chimeras of Guillermo Garcia Carsí, the creator of Pocoyo! Witness a trio of cyber-tech apes in their battle against an unscrupulous, fascist dictator! Experience a millennium of messed-up history from the point-of-view of a stranded robo-alien! Locura Española is an aphrodisiacal experience straight from the land of Spanish madmen!